Analysis: Bray didn’t play due to injury, but he returned to practice this week and retook his spot ahead of Murray. That probably isn’t a great sign for Murray’s chances, but you never know what Chiefs coach Andy Reid is thinking. The lack of snaps for Hogan isn’t surprising, since he’s clearly the fifth quarterback in the rotation. It’s hard to imagine the Chiefs giving up on him this early, so it will be interesting to see how the Chiefs manage all these numbers. Analysis: Reaves got more work than Davis, but the latter got the majority of the third-quarter work — and even a little second-quarter work — while Reaves worked the fourth quarter. Millard left the game with a knee injury. West didn’t play due to injury, but he returned to practice this week and continues to get reps behind Ware, who has gotten the large majority of first-string reps while Jamaal Charles continues to work his way back from injury. Analysis: Conley, who had a nice game, appears to have surged ahead of Wilson for the No. 2 spot opposite Maclin. Wilson entered the game when the Chiefs went with three wideouts, while Hill — who entered late in the second quarter — was the fourth receiver to enter the mix and appears to be secure. Williams was released on Wednesday. His lack of playing time was an indicator of that. Robinson got a lot of third-quarter work with Thomas and Streater, with no Hammond, as far as I could tell. Mathews, Jones and Moore only logged some special-teams snaps. Not a great sign for young players hoping to make the 53-man roster, though Jones and Mathews — who are each big, developmental targets — could have some practice-squad potential. Analysis: O’Shaughnessy and Travis got more reps than Harris, but don’t read too much into it; Harris was still the No. 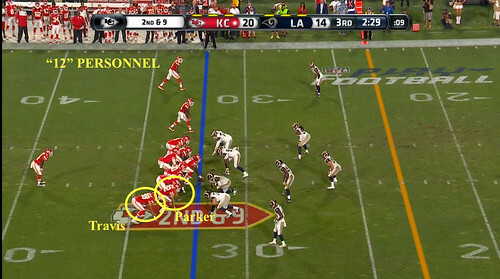 2 tight end in the game, and the man who replaced Kelce late in the second quarter. But keep an eye on the fourth tight end, as Parker — not O’Shaughnessy — earned reps next to Travis in the third quarter whenever the Chiefs went with two-tight-end personnel. The Chiefs went with a ton of “11” personnel in the fourth quarter, leaving O’Shaughnessy as the sole tight end on the field in what appears to be Aaron Murray’s favorite personnel grouping. Analysis: Not much to note here, other than the fact Sterup — who was recently popped for a performance-enhancing substance — continued to take the second-team reps at left tackle. The Chiefs can save a roster spot by placing him on the reserve/injured list while he serves a four-game suspension, so the fact they haven’t cut him is probably a positive sign. Perhaps he makes the practice squad after he’s reinstated.